God this just wasted a lot of my time. IMO that guy doesn't have a good understanding of how the game works. He also doesn't make the cards sound Wizards-like (they aren't worded as WotC would word them). Take this one for example. He doesn't actually mention whose control the effect places the Vampire under. Or in the case of this card, he really should have used references such as this card or this card which pretty much explain how WotC words forced targeting. Thus, a more WotC-like wording would be "Whenever a player casts an aura spell, that player must choose Sengoku Nadeko as the target for that spell." His effects obviously aren't made to be directly witty/flavorful, either. Most of them seem like just random cards named something anime-related just to garner attention, but the effects don't have much to do with the subject. Like this. What the hell does a self-defense spell that resets your memory have to do with searching up same-manacost creature cards? Wild Pair was obviously used as the base, but even the semantics of the effect were not followed. 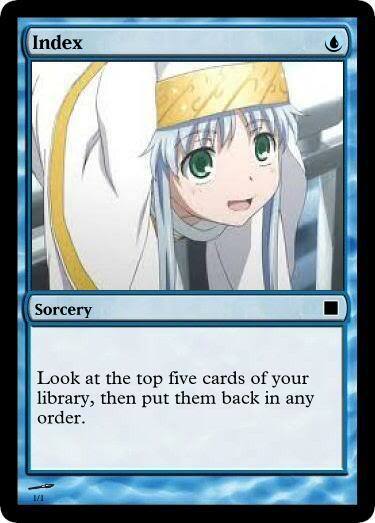 IMO if you make anime-themed cards, you shouldn't make "good" cards. You should make cards that do something that sets them apart, with an effect that is immediately associated with the subject. TL;DR: that guy makes cards for anime fans who don't have a deeper understanding of the game. It would have been clever and I would have laughed. So what, are we going to spam this thread with cards? I didn't even look at the Hellsing cards, I only looked at about half of the collection. But I agree, some of the card's terminology wasn't perfect and I was wondering about the feather of light card amongst others for how they were associated with the anime relation. 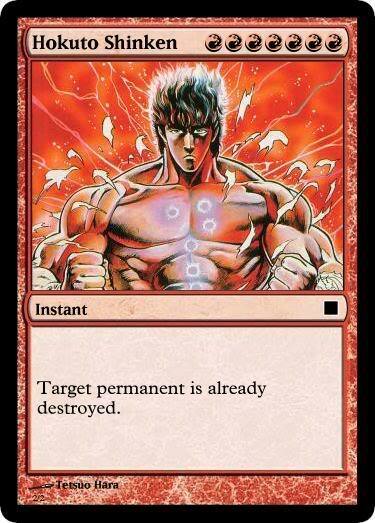 But what I noticed the most as far as mis-wording the cards was the lack of strictness to any given situation, such as with the Nadeko Snake one you linked, he really needs to add "if able" to the end or else the card would have some rules violations if there was a shroud effect on her or something. But anyways, beyond the imperfection, I thought at least 50% of the ones I actually took the time to look at were clever such as the Rainy Devil, Misaka, Araragi and Loneliness Circuit. Hi, I am the author of the AnimeMTGCards site and would love hear any comments you might have, and maybe even respond to some of them as good as I can. First of all, I apologize if the the quality of the cards is not up to WotC standards. WotC has a dozen of full-time professional designers and developers working on each set for about a year, not to mention their own small army of beta testers. Clearly, if I were able to churn out cards with the same quality of WotC in about an hour per card (as this clearly is a hobby I do on my spare time), something would be awfully wrong. I also acknowledge that the some of the older cards are probably not as good as some of the newer cards, and at some point I pondered taking them offline altogether. In the end I decided to just let them stay, and serve as a metric against which to measure new cards. Second, I must say that when possible, I do follow WotC wording templates. The flagbearer case is specially interesting, because WotC has changed its Gatherer text almost with each mayor Gatherer update, making it kind of a moving target. Because of that, I instead used my own wording and avoided the issue altogether. Also please note that Sengoku's ability is NOT the same as the flagbearer ability, it does something simlar but different, and thats why the text is different too. (The regular flagbearer ability is a static ability, while my approach is to use a triggered one; WotC couldn't have used my approach because of their goal of keeping abilities functionally the same as they were printed). For example, Sengoku's triggered ability could be Stiffled, whereas the flagbearers static ability could not. If one where to cricticize Nadeko, it would be preferable to instead point to the obvious syntax error on her second ability, which I never got to fix given that I lost her original file. Also, please be aware that the fact that the cards are not 'funny' is a concious design decision. I wanted the cards to be mostly playable. Obviously, this decision has kept me from doing some 'funny' cards, but in the end I can live without them, there is plenty of people already doing that. It is also interesting that you mention they are not 'witty' but specifically picked 'Feather of light' as an example. You see, if you remember that episode especifically, they mention that the Feather basically browsed the mind of Index for the spell that would most perfectly countered any situation, which is the effect the card has. Certainly in the anime, the Feather had other abilites as well, but I just picked one of them for the card as I dislike crowding the text box with too many effects. Of course, I won't say the card can't be improved: there is always room for that. In regards to the Integra card, per rule "110.5a A token is both owned and controlled by the player under whose control it entered the battlefield" specifying who gets control of the token is a bit redundant. In fact this is probably the reason why modern cards don't have this wording, just take a look Abassador Oak, Ant Queen, Wolf-skull Shaman or Violet Pall, just to cite a few examples. Finally as per rule "609.3. If an effect attempts to do something impossible, it does only as much as possible." I do not have to add "if able" on cards in which nothing wrong would happen if you fail to take an action. Are there any other cards that you would like to discuss? My MtG knowledge may not be on par, but I'll try to do what I can. Well I guess this is what happens when people link somewhere directly, welcome to this little forum. Thanks for clearing up our comments, especially the Feather of Light one, I completely forgot about that from the show. Had I re-watched the first season like I wanted to, I probably would have caught that. I haven't played MTG in about 3 years now, so I'm not familiar with how a lot of the terminology has evolved but I guess the rules have been updated to the point where many things don't have to be explicitly mentioned. Anyways I have to say that your collection was a lot of fun to look through, I really didn't have any real complaints in the first place, obviously this is something you do for fun and even with that said they're relatively well done IMO. I'm sorry if you saw this thread as a place for us to bash on your designs, that wasn't my intention when I made it. I noticed that since you were making cards from Kore wa Zombie and Madoka it meant that you were still making cards for fun as of recent, so I had bookmarked your site to check out every once in awhile to see if you've made anything new, as even though I don't play anymore I still find them interesting to read. Well, I must say I am impressed. I had originally thought that upon hearing that the creator himself was here to defend himself, that he/she would be insecure, rude, and/or immature, and was ready for a "get used to it and welcome to the internet" sort of argument. However, I see now that the problem wasn't that of ignorance, but that I had wrongfully assumed you were making those cards for a different purpose, or rather with a different design philosophy. Upon closer examination, your site does adhere to a higher standard than my initial impression gave it credit for, and it was many of your older cards are the ones I found problems with, so I apologize for unfairly dismissing your work. I fully condone people making MTG cards for fun and I'd be lying if I said I don't find enjoyment in the practice myself. It's just that the vast majority of people I see trying to make cards have no idea what they want their end result to be, so hopefully you'll understand if I defaulted to that assumption. Had you not come forward and explained yourself, I would have continued to assume you were unaware of Wizards' pre-established card protocols rather than consciously deciding against them. That being said, I think that flavor and accessibility take precedence above practicality. However, I think that flavor also needs to be generally accessible (unless you're like Kouji Kumeta). In the case of Feather of Light, I honestly don't think many people will be able to recall specific details about that episode, but they know the end effect. I had always thought that it was her "Johann's Pen" self-defense thing that enabled her to analyze situations and choose magic spells, but Feather of Light was a spell that was specifically used as a last resort to wipe her own memory. Thus, I would have thought a discard or milling effect to be more appropriate, or at least more easily/commonly associated with the spell. That's really all just my opinion, though. Your cards don't really cater to my tastes (nor do they really have to), and I apologize for bashing them just because they don't. I also probably shouldn't direct link, but it's really just like 3 people on this forum anyways. I hope you make Fractale cards, that's my favorite show this season. In hindsight, yes probably the card should have been renamed as you mentioned. Unfortunately, I no longer have the original files for the first set of cards I made, so I can't correct them anymore (and I don't feel like doing that card again soon). Are there any other series that you would be interesting in seeing cards from? I'm specially looking forward for more recent series, simply because they tend to have better art and are usually more "visible" to people looking aroung for this kind of stuff.